Comic-Con season was pretty good for me this year. I did a couple of local conventions, nothing too huge. Some new people bought — and hopefully enjoyed — Gamer Girl & Vixen. If you’ve never read my comic before, the graphic novel is still available to order! And I think I’m going to try really hard to have some new comics to show off for next convention season. Speaking of comics, it’s a pretty big week. 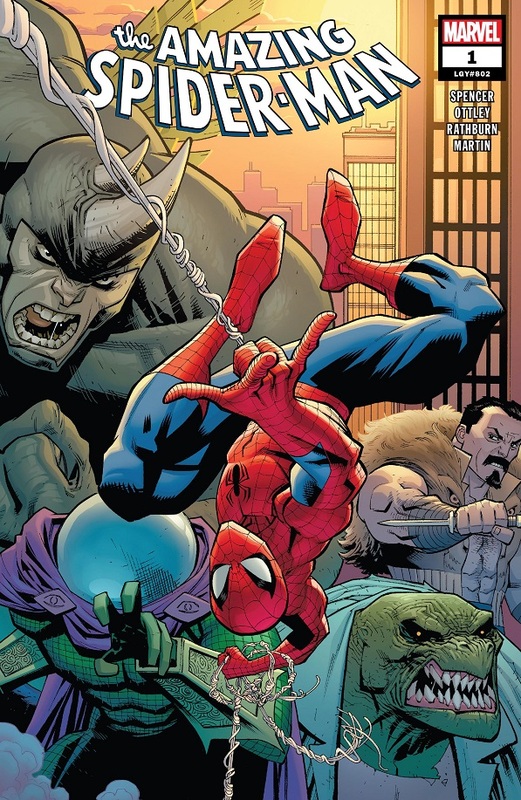 We’ve got the first issues of Amazing Spider-Man and Superman, kicking off those new creative teams. 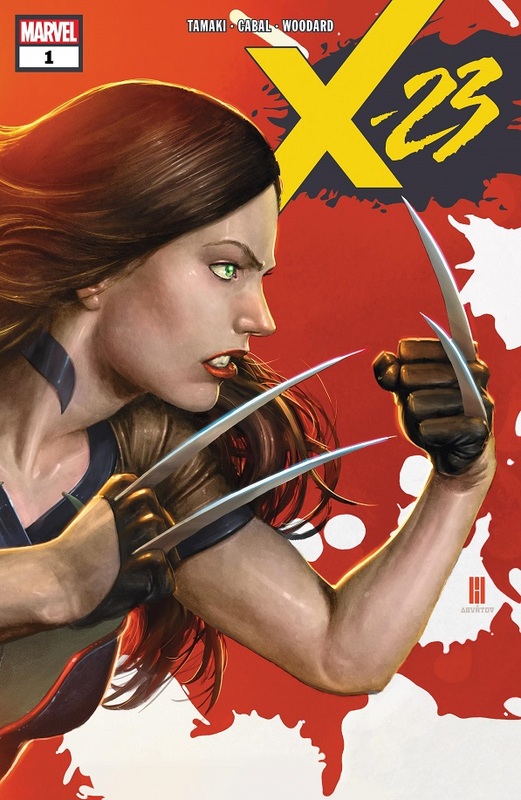 We’ve also got the debut of the new X-23 series, which wins Comic Book of the Week for the best, cleanest and most entertaining series debut this week. Meanwhile, I would like to point out that there are not one, but TWO courtroom scenes in this week’s comics that don’t understand how the criminal justice system works. Due to my day job, this is one of those things that really grinds my gears. There should be no excuse for not knowing that you don’t immediately launch into a jury trial the same day you’re arrested. That stuff takes time! A long time! I could go on, but I’ll spare you for now. You can go back and read a full article I wrote on all the nitpicks I had. I must sadly decline from reviewing Unbeatable Squirrel Girl this week. It’s still a fun comic, but it’s complete disregard for how a courtroom actually works just pressed all of my buttons. Comic Reviews: Amazing Spider-Man #1, Domino #4, Ms. Marvel #32, Superman #1 and X-23 #1. I like Nick Spencer just fine. I don’t really use Twitter, so I can’t comment on whatever went down when he was writing Secret Empire. But I’m totally down with him writing Amazing Spider-Man. Peter Parker is having a really bad day. When Empire State University unveils a new plagiarism detection device, they use him as a guinea pig and reveal that his doctoral thesis was really the work of Otto Octavius! That was back when Otto was in control of Peter’s body and took the time to complete Peter’s post-graduate degree, but Peter can’t exactly explain that to ESU, so he’s forced to go along with having his academic reputation dragged through the mud. The plagiarism accusations also cost him his job as science editor at the Daily Bugle, and Aunt May is super disappointed in him for cheating. Again, Peter didn’t really cheat, but he didn’t exactly correct anybody when he regained his body and decided to keep the degree. That’s not the responsible thing to do. Meanwhile, NYC Mayor Wilson Fisk has started a publicity campaign to promote Spider-Man, which puts Spidey at odds with his fellow NYC superheroes. They’re none too happy to see him when he shows up to help fight a never-ending invasion of bug monsters downtown. But Peter figures out a way to close the portal, even if it might get him killed — but he needn’t worry, because the “portal” is actually Mysterio’s ship and he’s easily defeated. But the near-sacrifice has caused Peter to rethink some things in his life and he asks Mary Jane to be his girlfriend again, and she readily agrees! Also, Peter is now sharing an apartment with Robbie Robertson and Boomerang, of all people. Peter is attempting to get dirt on Fred’s latest criminal scheme, so he’s going along with it. Double also, Mysterio was set up by some evil rot-themed villain who wants to get at Peter. He hires Janice Lincoln as an attorney to get Mysterio off on an insanity plea, and I wince at how little Nick Spencer knows about court proceedings. You don’t have a jury for a first court appearance. Triple also, ESU re-contacts Peter and says they were planning to strip him of all academic titles, but one of their faculty wants to give Peter a second chance: the Lizard, who is teaching a class as the Lizard. This issue was packed to the gills with content, to the point that I was a little shocked they’d go this deep on a fresh start issue #1. There’s just so much going on, and not all of it linearly, and it was a surprise. I would have expected something neater and cleaner to kick off a brand new era of Amazing Spider-Man. But nope! Spencer and Marvel dig so darn deep within continuity, and thankfully, most of it works. I’m a little disappointed at how quickly and efficiently Spencer cuts away parts of Dan Slott’s run. Peter loses his doctorate and his Daily Bugle job all at once? And his reputation is immediately trashed both professionally and among fellow superheroes? Jeez louis! I know Peter Parker is supposed to have bad luck, but I was getting whiplash at how quickly bits and pieces were being carved away. That’s not to say the comic wasn’t good. 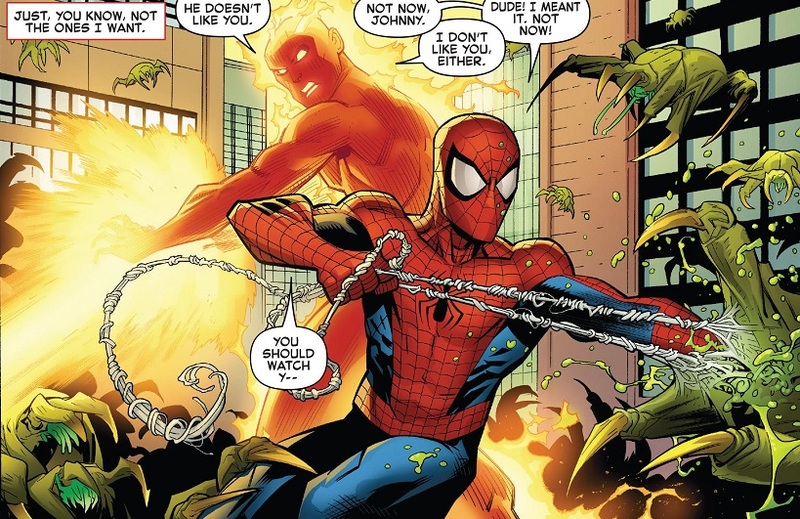 Spencer has a solid take on Peter Parker, and since most of the issue was his inner narration, he managed to carry us through every crazy change. I wasn’t overwhelmed to the point of losing interest. I stuck with the story and enjoyed it just fine. Though we won’t really know how Spencer’s Peter Parker really plays out until we’re a few issues deep, considering this first issue was more concerned with forcing Peter into the new status quo than in actually presenting him as a character. The big news coming out of this issue is Peter getting back together with Mary Jane. I’m fine with it. I was one of those comic fans that really didn’t care for One More Day/Brand New Day way back in the day. I thought it was a dumb move and Marvel never really capitalized on it as well as they wanted. But I’ve also really mellowed in my old age and don’t really get upset about retcons and whatnot in comics (unless they’re so stupid that they actively work against the comic, like DC’s recent decision to place the destruction of Krypton down to a single guy, and then making that guy ridiculously boring). So I wasn’t chomping at the bit to get Peter and MJ back together, but I’m also not opposed to it. I’m open to see where Spencer goes with this and I hope their relationship is an actual story with ups and downs, with the two of them reflecting on what happened, instead of them just returning to the married couple status quo of old. Basically, if you’re going to get Peter and Mary Jane back together, make it an actual story instead of just a quick fix. TL;DR: The first issue of the new era of Amazing Spider-Man is a big, jumbled comic full of old continuity and choppy status quo-building, but it’s still a fun introduction to the new Amazing Spider-Man. 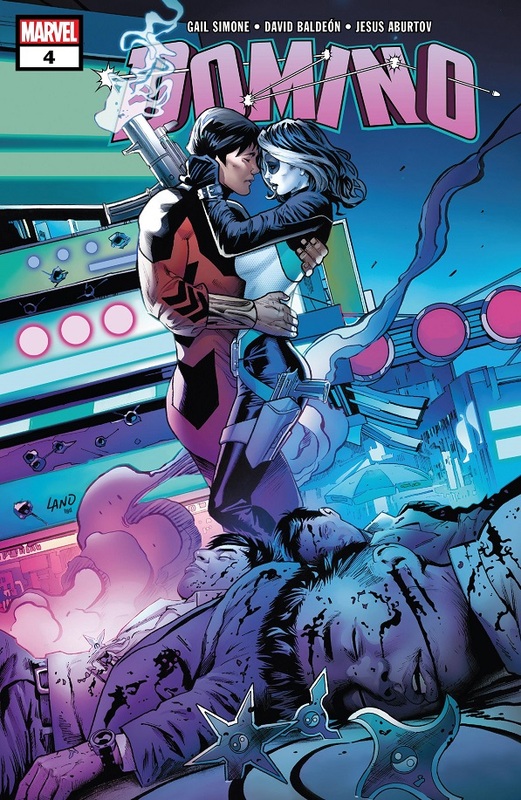 I would be totally OK with Domino and Shang-Chi becoming the new power couple of the Marvel Universe. Back when Domino was a child, she was held for study in Project Armageddon at Halcyon Electives. That’s where she got her facial brand. Also at Halcyon were Topaz and Desmond, who was born on the same day as Domino, and whose body gets hurt when Domino gets lucky. In their quest to find the traitor, Diamondback and Outlaw make their way to Halcyon and face off against Topaz and Desmond, who goes by the name Prototype. Meanwhile, Domino trains with Shang-Chi and eventually convinces him to go out dancing for a bit of fun. They share a kiss, but are soon interrupted by a bunch of bad guys out for revenge against Shang-Chi. This was a solid issue, though Simone didn’t do as much as I would have liked or hoped with Shang-Chi and Domino. They kind of just spar, which is the only thing you would expect to happen when you introduce Shang-Chi as a guest star. That she takes him dancing by the end is fun, along with a touch of make out session. But I would have liked a bit more chemistry between the two. Fortunately, Diamondback and Outlaw have plenty of chemistry together, so their side mission is all manner of fun. And Simone continues to use Deadpool well as a guest star. I think I’m more interested in what they’re up to, and the mysterious origins of our villains (and Domino), than I am in Domino just hanging out with Shang-Chi. I think everybody on Earth would be OK with a Shang-Chi/Domino whirlwind romance, Gail Simone! Just go for broke! TL;DR: A fun, solid issue of Domino that moves the story along, but doesn’t really shine in any particular way. Did you hear that G. Willow Wilson is going to become the new writer on Wonder Woman by the end of the year? I think that’s great news! She’s a writer I will now follow anywhere, and that’s a good excuse to start reading Wonder Woman again. 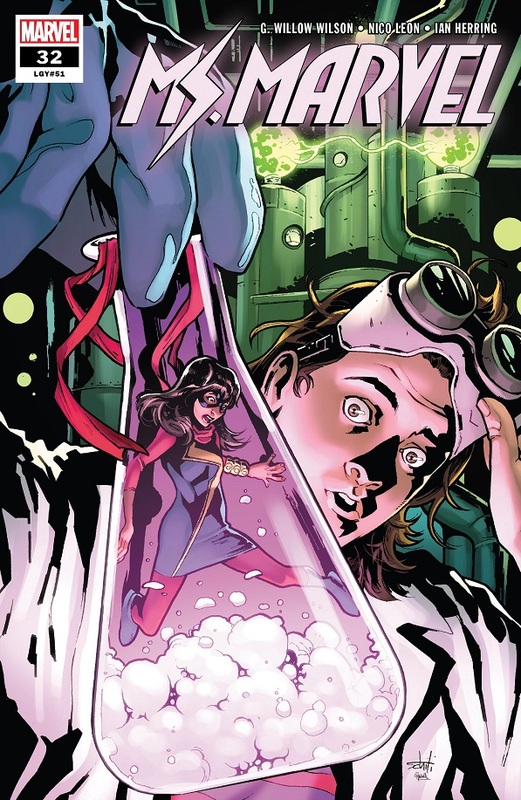 Now that Bruno is back, he and Kamala get to work in the lab running some experiments to try and figure out how her powers work, biologically speaking. When Bruno attaches a sensor onto Kamala, her powers start to freak out and she grows and shrinks out of control. So they take a break and get some food, and run into the Shocker committing a burglary downtown. Ms. Marvel goes out to fight him, but her powers are out of control and she shrinks really small! This was a fun issue to kick off the post-50th issue. I am 100% on board for any story that involves the main character and her supporting cast trying to figure out how her powers work. I love exploring the ins and outs of superhero stuff that might normally be taken for granted. So this issue was right up my alley, with the awkward Bruno/Kamala reunion being played to good effect while they ran through some experiments — and I’ll forgive how weird it is that their high school has all of this extreme scientific equipment, that apparently only Bruno uses. 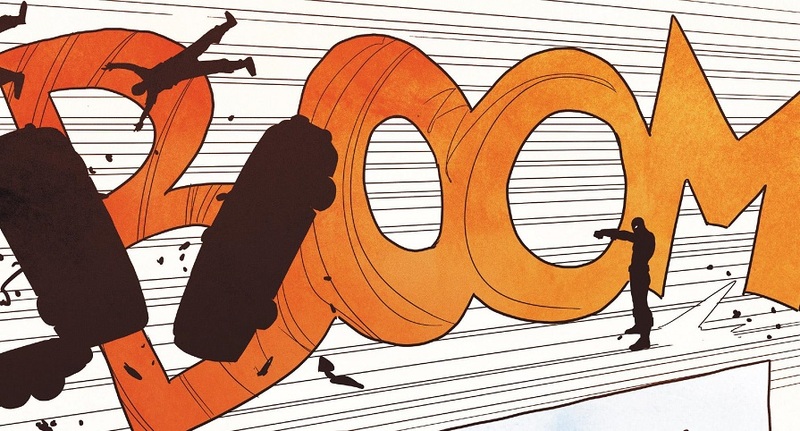 The whole bit with Kamala’s powers freaking out is fun, too! We’ve gone this long with her powers working just fine. It sounds like a solid new storyline to me. This issue also features a pretty amazing Shocker moment. The Shocker is one of my all-time favorite comic book villains. Leon and the art time nail his appearance in this issue, and I have confidence that Wilson will do something fun with the character. Obviously the issue really isn’t about him, but he’s still used to great effect. TL;DR: New storyline, new troubles and still the same fun Ms. Marvel moments. Here we go! After a 6-issue mini-series that I largely found unnecessary and boring by the end, Brian Michael Bendis’ Superman kicks off for real! After a desperate and failed attempt to just fly out into space to try and find his wife and son, Superman returns to his place on Earth, confident that Lois can handle herself. Still, Clark is pretty lonely, and Rogal Zaar destroyed his Fortress of Solitude. So he sets about building a new one in the Bermuda Triangle. Just for kicks, I think. At work the next day, he’s visited by Martian Manhunter, who suggests to Superman that he should step up and be a global leader. Someday soon, Earth is going to join the rest of the galaxy, and they can’t really do that with their current geopolitical strife. Political borders and money and guns aren’t going to mean squat to the rest of the universe. But J’onn’s ideas a little too forceful for Superman’s likely; still, he’ll give them some thought. As Superman flies away, he suddenly realizes that the entire Earth has been transported into the Phantom Zone! And the comic remains underwhelming. Bendis does have some nice, clever moments in his Superman comics. During the conversation with Martian Manhunter, Superman keeps having to pause the convo so that he can fly off and help someone in need. It’s a funny bit. And I like how the comic is written in general. But I really am expecting more from Bendis. His run on this title is so hyped that there are going to be television commercials. And yet, across seven issues, he hasn’t done much to really push any boundaries or present anything new for Superman. It’s kind of business-as-usual Superman. The loneliness aspect might be fun to explore. I don’t know the last time Clark was without Lois. And Bendis might be laying the seeds to have Superman really look into what he does for the world. I definitely like J’onn’s proposal. Ever since Geoff Johns’ wrote some throwaway line for Sinestro, about being appalled that Earth still has political borders, I’ve really liked the idea of how our planet Earth can possibly measure up to the vast communities these comic book universes build up across their galaxies. 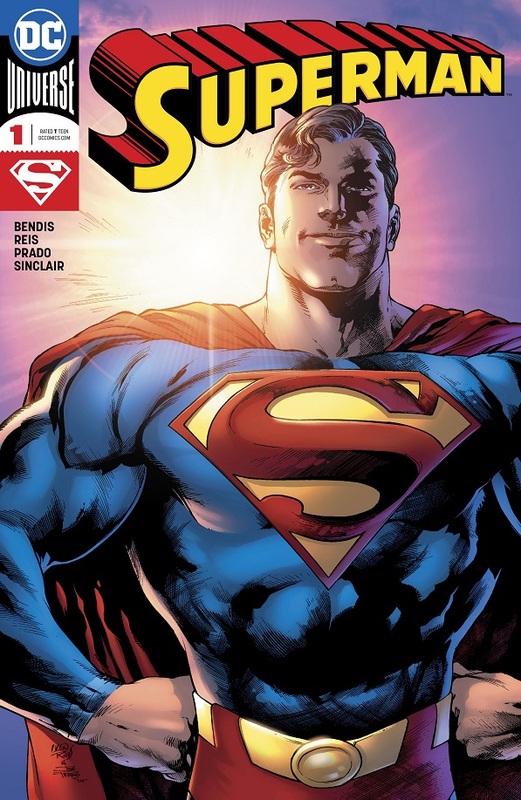 And the idea that Superman might take a leading role in preparing Earth to join the galactic civilization is the sort of thing I would like to see from Bendis’ run. Now that’s a new and interesting storyline. But nah, the issue ends with Earth transported to the Phantom Zone so that Superman can get punched by Rogol Zaar again. TL;DR: The art is obviously amazing on Superman, but Bendis has yet to really capture me with his ongoing storyline for the Man of Steel. I enjoyed Tamaki’s She-Hulk up until I didn’t. 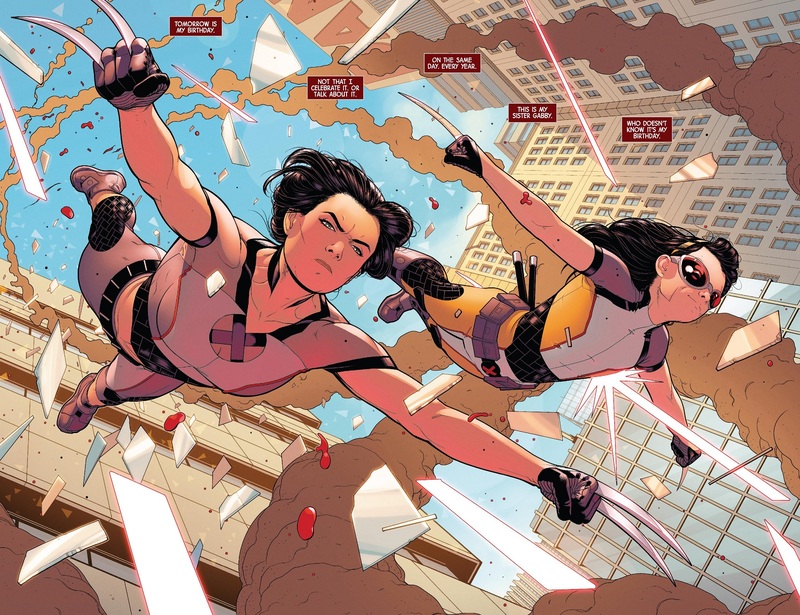 But after my love of Tom Taylor’s All-New Wolverine, I’m more than willing to give her another chance on X-23. X-23 and Honey Badger pursue a group of DNA thieves to stop Wolverine’s DNA from spreading to more cloning operations. Beast then summons them to the X-Mansion to give Laura info about a kidnapped cloning scientist who worked for Alchemax, someone Laura can pursue. While at the school, the girls run into the Stepford Cuckoos in the hallway. They’re going out to celebrate their birthday, and that gets Gabby wondering about birthdays. Laura’s birthday is coming up, but she doesn’t want to attach any significant meaning to the date she was created, so she tries to shoot down Gabby’s curiosity — which doesn’t work out so well, giving Gabby’s young age. She wants a birthday cake, goshdarnit! Meanwhile, the Cuckoos’ birthday involves their two dead sisters, whom they’ve cloned with the help of the scientist they kidnapped. They’re planning to reunite into the Five-in-One, but the clone bodies are pretty crappy. And the one evil sister has something truly evil planned for the other cloned sister. 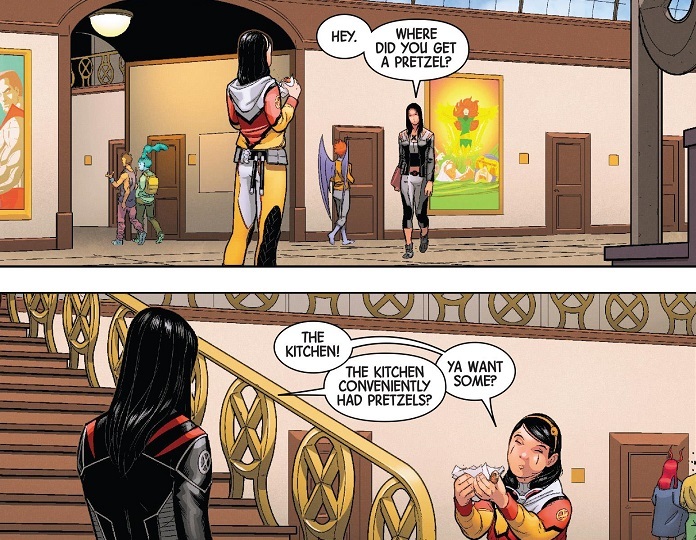 The one and only sin this comic commits is not explaining why Laura goes back to the name ‘X-23’. As far as I know, the original Wolverine isn’t back yet, so it’s not like she’s handing him the name back. And even if she was willingly giving up the name for him, why go back to ‘X-23’? That’s just the dumbest name! When Gabby can get the name Honey Badger on the spot, surely Laura can pick a new and better name, with Gabby’s help. That would be a great ongoing subplot for this comic. Beyond that sin, the comic is otherwise great! Tamaki has a great handle on her lead characters, using the birthday thing to really showcase Laura and Gabby’s personalities. It’s a fun angle to explore for a pair of clones, and I especially loved Gabby’s juvenile petulance. Tamaki nails the character. And that’s going to be key to making this series work. I feel like Laura could use a bit more personality, and I had that problem with All-New Wolverine, too. Laura is the star. But she always comes off as just a straight-forward OK person. She doesn’t really show emotions a lot. I suppose that could be her character, and I don’t have a long history reading about her, so I might be totally wrong in asking this, but I think she should have a bit more personality to really hang the book on. I don’t want this comic to just be Laura going through the motions. Doesn’t she have any thoughts, feelings, dreams or emotions that aren’t just being X-23 at all times? Based on this first issue, I can really see a lot of opportunities to get her to come out of her shell. Like I said, Tamaki is great with Gabby, and she does an awesome job with the Cuckoos as well. I foresee some fun and exciting adventures! Also, major kudos to Cabal and the art team. Their shots of the interior of the X-Mansion are spectacular and really make the place look like a legit building/mutant school. Has anyone considered enrolling the child, Gabby, into school? I really got the sense that this was a lived-in and used building with its own stuff going on, and Laura and Gabby were just popping in. It was a fun feeling and high praise for the art team. TL;DR: X-23 is in really good hands with the new creative team, who debut with a very strong and fun first issue. There is some room for improvement going forward, and I’m confident this team can pull it off. Posted on July 14, 2018, in Comics, DC, Marvel, Reviews, Spider-Man, Superman, X-Men and tagged Amazing Spider-Man, Domino, Kamala Khan, Ms. Marvel, X-23. Bookmark the permalink. 6 Comments. To answer your question, Laura has never had much of a live outside of superheroics. At least not for very long. She’s a very focused and dedicated character. That makes sense! Well here’s the perfect opportunity to start giving her that life! ASM is ASM. It’s Spider-Man. I just can’t care. Because it doesn’t matter how well-made it is, I’ve read it before. It’s Spider-Man doing the things he always does, just with slightly different configurations. Domino is a lot of fun. I really want to see the Trampy Iron Fist costume. Inez and Diamondback are a lot of fun. Ms. Marvel is really good. Lots of fun. Kamala and Bruno have great chemistry, and Shocker’s always a fun villain. X-23 is great, aside from the name and costume. I hate that she’s back to being X-23, when a key point of All-New Wolverine was her moving beyond that. It’s an idiotic backslide from a company that is absolutely terrified of the very idea of permanent change. I’m also disappointed that the Cuckoos are back to looking alike, but they’ve got style, so I’ll allow it. Other than that, it’s a pretty great comic. I hear you about Spider-Man. A very good point. Giving X-23 a real superhero name would be such a great permanent change. I would be totally fine with her being the new Wolverine. That could have been something special! Or any other name in existence beyond ‘X-23’. Ugh. The art team made the de-vamped Cuckoos look so good that I’m totally fine with them reverting. It’s a unique, freaky look! Continuing those great reviews. A lot of fun, even when I don’t agree. Thanks! I’m glad somebody’s enjoying them!